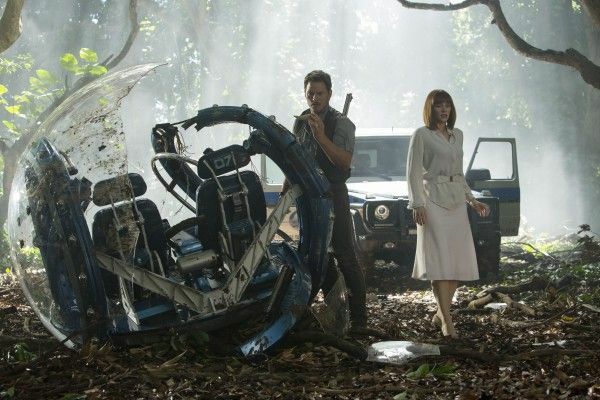 Along with today’s first Jurassic World trailer, Universal Pictures has also released four new images from the upcoming sequel. The movie takes place 22 years after Jurassic Park and is set on a fully functional park on Isla Nublar. The folks running Jurassic World think genetically modified dinosaurs are a good idea, and so naturally bad things happen. These images show off one of the film’s new doohickeys, a gyroball (not the official name, but I don’t know what else to call it), which looks like it tumbled out of Oblivion and got a paintjob. Hit the jump to check out the new Jurassic World images. The film opens in 3D on June 12, 2015, and stars Chris Pratt, Bryce Dallas Howard, Nick Robinson, Ty Simpkins, Vincent D’Onofrio, Irrfan Khan, Jake Johnson, Omar Sy, and Judy Greer.